Versatile - A Roto-Die Hydraulic Sheet Metal Bender is as simple to operate as a hand brake - but has infinitely more production capacity. Productive - Most sheet-metal configurations can be formed with just one handling by one operator. Profitable - Roto-Die Hydraulic Benders are engineered to cut costs – labor costs are reduced while shop productivity is increased. 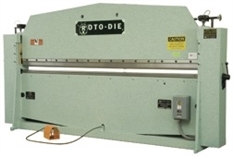 The patented Roto-Die hydraulic sheet metal benders have been a fixture in thousands of sheetmetal shops for over 45 years.